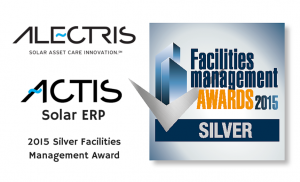 ATHENS, Greece – 7 December 2015: Alectris, a leading global solar asset care innovation firm, today announced its Solar ERP (Enterprise Resource Planning) tool, ACTIS, has won again at the annual Facilities Management awards competition. 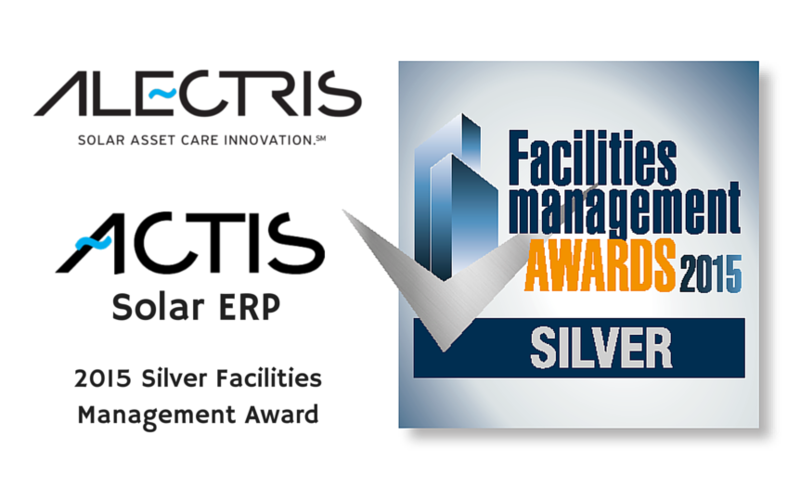 The Silver accolade in the Management Tools category was awarded Tuesday, November 3, at the Facilities Management Awards program in Athens, Greece. The program is organized by Boussias Communications to celebrate the accomplishments of facilities management professionals and their companies. The Facilities Management Awards highlight and reward the best practices in the management of business establishments, organizations, operators and service providers. The ceremony was attended by over 230 senior executives of the largest companies and institutions of the Facilities Management industry in Greece. The awards were held in cooperation with the Hellenic Facilities Management Association and the honorary support of the Hellenic Maintenance Society and the American Society of Civil Engineers. The world’s first solar ERP (Enterprise Resource Planning), ACTIS was developed by Alectris to manage its client photovoltaic (PV) assets. The software was created to bring a holistic approach to solar asset care integrating solar monitoring, operations and maintenance and asset management. ACTIS, (Asset Control Telemetry Information System) is now in use in over 300 solar PV megawatt’s (MWs) globally. Alectris delivers asset care innovation for the global solar industry. Our end-to-end solutions engineer profitability into every solar lifecycle stage. With our integrated suite of products, services and award-winning software, we empower solar operators to increase plant productivity by providing one source for operations, maintenance and management support. Connect with us on LinkedIn and Twitter or visit us at www.alectris.com.